Situated just 1 hour from Nagano city in the neighboring prefecture of Niigata, Myoko Kogen boasts one of Japans’ top annual snowfalls. The impressive Mt Myoko (2454m) provides the perfect backdrop for this quant Japanese ski town. Founded in the 1930’s, Myoko is one of the oldest established ski areas in the world. With its rich history, you have the ideal holiday place to enjoy a total Japan ski resort experience. The Myoko Ski Area is made up of ten mountains: Myoko Akakura Onsen, Akakan Resort (a.k.a. Akakura Kanko or Shin-Akakura), Ikenotaira Onsen, Myoko Suginohara (which boasts the longest ski run in Japan), Seki Onsen, Kyukamura, Myoko Ski Park, APA Resort Myoko Pine Valley (presently closed), Madarao Kogen and Tangram Ski Circus, all with their own distinctive and special features. With great quality powder snow, terrain parks, refreshing long runs and kids parks / child care for small children, the Myoko Kogen Ski Area has something for all skiers. 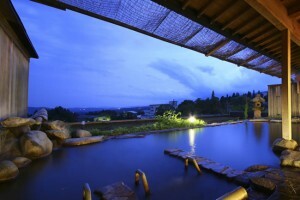 Myoko is also famous for its hot springs with 7 areas to choose from. Each onsen has slightly different characteristics in terms of minerals and temparature but they all share one thing on common; they feel damn good at the end of a day on the slopes. After your arrival, passport and customs clearance, head downstairs to the basement level JR stations, located in both terminals of the airport. The most convenient train is the Narita Express (N’EX), which leaves roughly every half hour for a 53-minute trip to Tokyo Station. Tickets for the entire trip up to Nagano Station can be purchased here; JR East Passes and Japan Rail Passes can also be exchanged at the JR East Travel Service Centers (see below). At Tokyo Station, head upstairs for the Hokuriku Shinkansen (the station is always busy, but all lines are well marked—just follow the signs). Hokuriku Shinkansen trains depart from platforms 20 through 23; all trains stop at Nagano Station, so you have many choices. The transfer from the Hokuriku Shinkansen to the local Shinano Tetsudo was recently stremlined so you can simply roll through the gate and on to the local train platform (with elevators helping you get your gear down to all platforms). 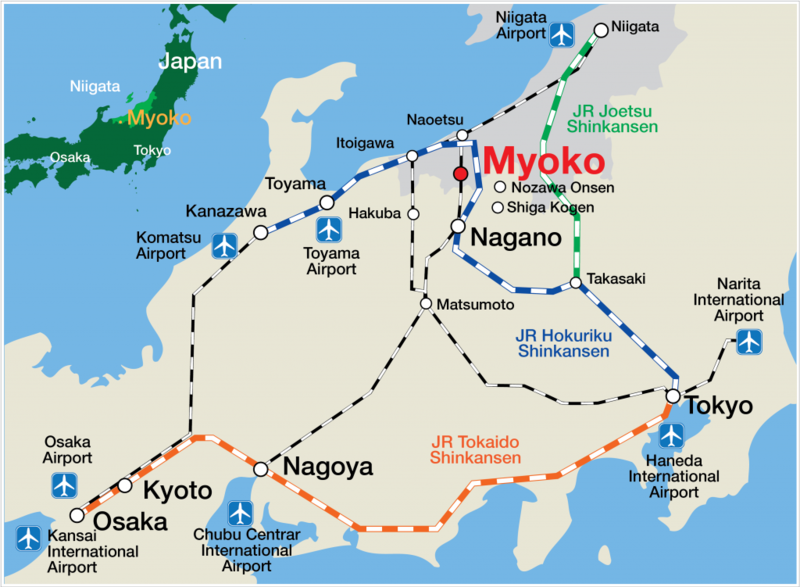 The slideshows below will help show you where you need to go on both the way to and returning from Myoko.